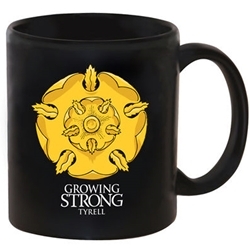 Get your Game of Thrones Tyrell Coffee Sigil Mug here and declare your allegiance to the Tyrells with the Game of Thrones House Tyrell Coffee Mug! House Tyrell of High garden is a noble house in the Reach. Represented by a golden rose in a green field, the Tyrell words are: “Growing Strong.. Continuing our series of licensed products based HBO's award-winning television series Game of Thrones, which is in turn based on the bestselling epic fantasy book series A Song of Ice and Fire by George R. R. Martin, we offer several mugs, each representing the house sigil of one of the noble families in the series.